Logic Oral Hygiene Gel Dog and Cat toothpaste helps prevent the formation of dental plaque and fights bad breath. Based on a multi-enzyme patented system, Logic Oral Hygiene Gel supplements the animal’s own defence mechanism to help fight harmful bacteria in the mouth. The gel also contains a surfactant which ensures that the active ingredients remain in contact with the teeth and gums and mild abrasives that help break down existing plaque. Tooth brushing is known to be the single most effective way of removing plaque and ideally Logic Oral Hygiene Gel should be used with regular brushing. However it will still be beneficial if the pet refuses a full dental regime. In this case the gel can be applied to the pet’s paw for the cat to lick off or directly into the mouth as instructed. 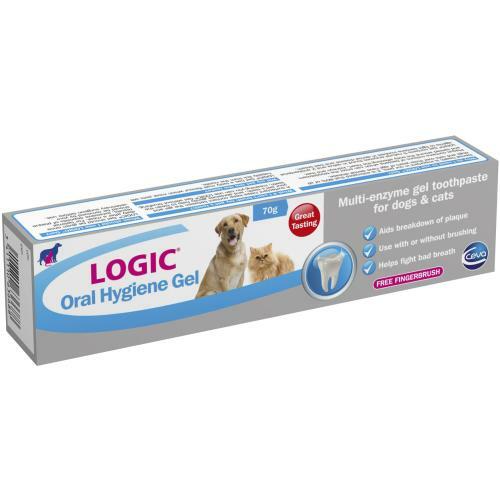 Logic Oral Hygiene Gel is suitable for cats and dogs of all ages and the ideal time for pet owners to start using it is after the teeth have been checked, descaled and polished by their vet.